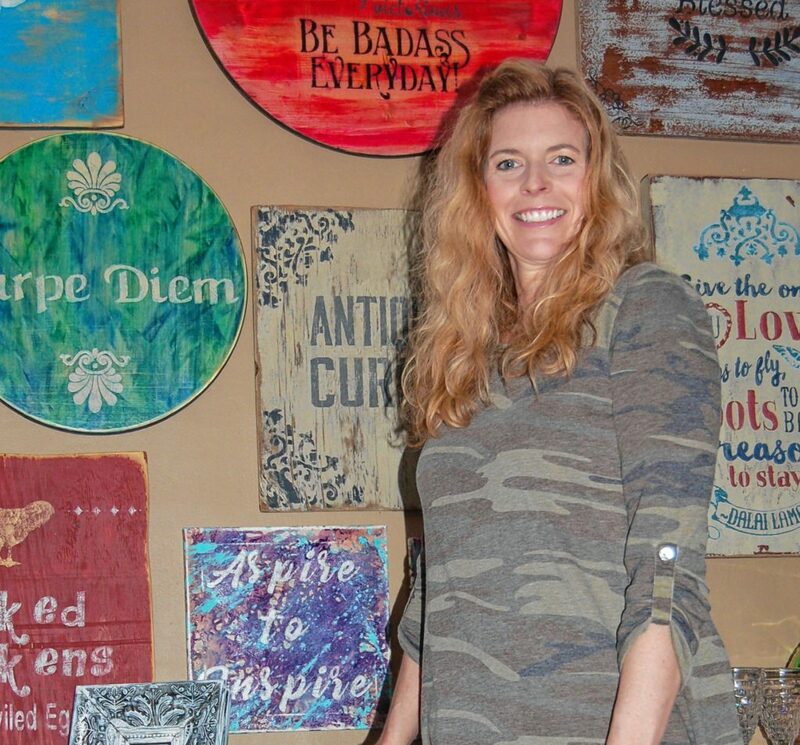 Longmeadow artist Marie Paynter rescues tag sale relics and upcycles them into attractive home decor. here, she stands with country wall plaques she stenciled on scrap wood, a night stand she refinished in a rustic wash, frames she embellished with buttons and, in the foreground, a vase made from the glass base of a broken, antique flashlight. 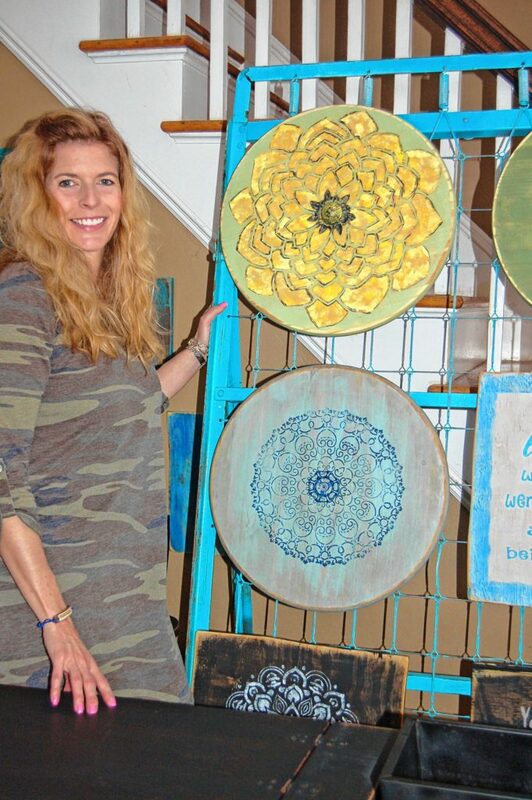 Longmeadow artist Marie Paynter stands with two of the floral wall plaques she stencils on discarded wood. On top, the center of the flower is half of an old golf ball. Below, the center is a discarded spigot handle. The display board they hang on is actually an old, metal bed frame she painted blue. Marie Paynter of Longmeadow often has outdated furniture on her front porch, but that’s her business. Owner of “Chick, Picked & Paynted,” Paynter is an artist and furniture upcycler who is saving the planet one gnarly, dump-destined coffee table at a time. “I try to use unconventional materials in creative ways,” said Paynter, a former psychology student with an analogous passion for creating art out of forlorn furniture by highlighting its intrinsic value and potential for new purpose. “This used to be a stereo cabinet,” the DIY guru said, opening a handsome, solidly-built hi-fi cabinet most would consider trash in the age of iPods and Spotify. Paynter cleaned the wood, made whatever simple repairs were necessary, painted it black with Aztec sunbursts on top, then “distressed” it by sanding the edges. Now, the cabinet looks as though she purchased it at Pottery Barn. “I put a basin in here where the stereo used to go and turned it into a cocktail bar,” Paynter said, sliding out shelves perfect for highball glasses, napkins, plates, and toothpicks. The basin, an enamel roasting pan, is the ideal size for icing a six-pack. 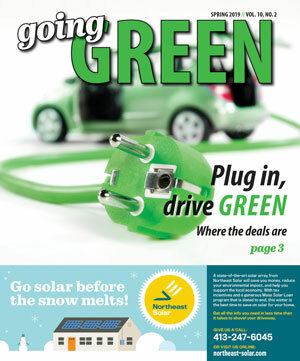 “To me, this is a great example of taking something and upcycling it into something else,” she said. Pointing out the table’s timeless craftsmanship and elegant, Queen Anne legs, Paynter shows the planter that now fills the sewing machine well. It’s perfect for sprouting a bouquet of exotic liqueurs. Next, she opens one of the front doors, which is fitted with carved wood casings. “That’s obviously where the thread used to go,” Paynter said. But the ghosts of Victorian seamstresses may be tittering, because now they hold shot-glass tubes for the popular “Test Tube Shooters” sold at trendy bars. The tubes, of course, are also reimagined. They once held Paynter’s husband’s cigars. Paynter spends her weekdays in her studio, but she spends her weekends “picking.” This means she actively harvests the fruits of the junk world at flea markets, tag sales, and auctions. She has even freed furniture humiliated behind “Free” signs on people’s front lawns. In the end, anything that tugs harder at Paynter’s creativity than at her purse strings is a win, and she brings it home to her studio. What motivates an artist to upcycle? It started two years ago when Paynter was laid off from her conventional job. With support from her husband, Michael, she invested her creativity, time, and $1,000 to see if she could build a business “flipping” old furniture and tag sale treasures. What began as a six-month experiment is now Paynter’s full-time business endeavor. She estimates she has already sold 200 pieces. With lots of help from Facebook groups, Pinterest, and the infinitely instructive YouTube — as well as excellent advice from Bay Path College Business Professor, Laurie Rosner — Paynter now has a studio well-stocked with quaint, country décor made almost exclusively from refreshed or repurposed items. For example, she cleaned and painted an old, metal washboard, then added dainty magnets to turn the bottom into a message board. She paints antique frames, highlighting the carvings, then attaching chicken wire to the back so people can clip photos and memorabilia to them. She uses salvaged wood to make stenciled, country signs with messages like, “Wicked chickens lay deviled eggs.” She displays these on an old, metal bed frame she painted turquoise and hung on the wall. Paynter also sells painted, floral plaques that use vintage jewelry, spigot handles, or golf ball halves as the flower’s center. She gives discarded oil lamp bases a mercury wash and resells them as antiqued vases. She adorns the edges of ordinary picture frames with buttons, and she revitalizes drab, passé styles with pretty paint washes, decoupage, children’s blocks, tin cookie cutters, or interesting scraps of chenille. Energized by the alchemy of before-and-after, it’s not unusual for Paynter to wake at night wrapped not in darkness, but in an epiphany of what color will transform a hideous, metal file cabinet she found into someone’s new treasure.